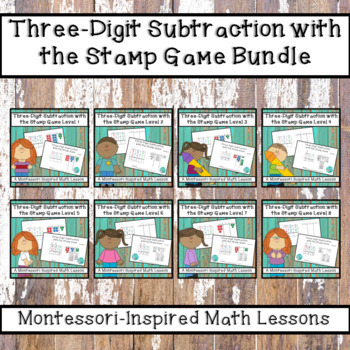 This Bargain Bundle contains 8 leveled booklets for teaching three-digit subtraction with the Montessori stamp game. These leveled booklets increase in difficulty and guide students from using concrete materials to visualizing the subtraction process in a more abstract way. Be sure to click on the Preview File to read detailed descriptions of each level.